Midnight at the Dragon Café is the much-talked-about debut novel telling the story of a young girl, the daughter of a small Ontario town's solitary Chinese family, whose life is changed over the course of one summer in the 1960s, when she learns the burden of secrets. Through Su-Jen's eyes, the hard life behind the scenes at the Dragon Café unfolds. As Su-Jen's father works continually for a better future, her mother, a beautiful but embittered woman, settles uneasily into their new life. Su-Jen feels the weight of her mother's unhappiness as Su-Jen's life takes her outside the restaurant and far from the customs of the traditional past. When Su-Jen's half-brother arrives, smouldering under the responsibilities he must bear as the dutiful Chinese son, he forms an alliance with Su-Jen's mother, one that will have devastating consequences. 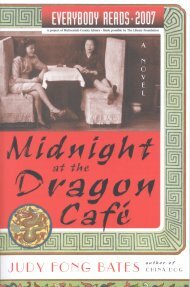 Written in spare, intimate prose, Midnight at the Dragon Café is vivid portrait of a childhood divided by two cultures and touched by unfulfilled longings and unspoken secrets.